If I were a slot machine, I think I’d be considered “hot” right now, because I keep giving the top hit recipes this month. Kaeng Khiao Wan was just posted earlier this month. Then Pad See Ew just last week. I was supposed to post a recipe for mango sticky rice this week. However, I had just come home from a trip, bought a box of mangoes and they were not ripe to the point where I could use them yet, so that recipe had to wait. But this week is another Thai food top hit again so don’t worry about sticky rice and mango, you will get the recipe soon enough. 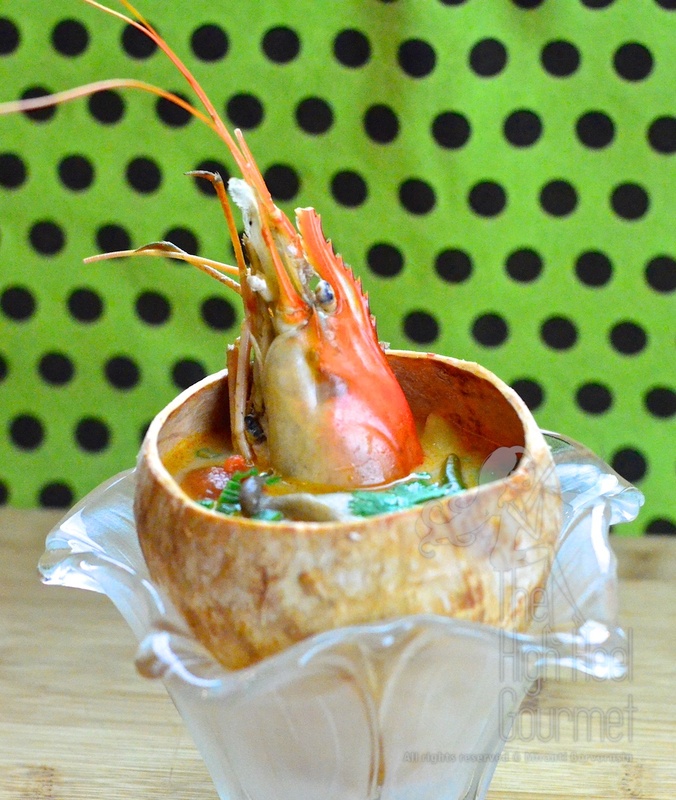 Tom Yum Goong is voted one of the most delicious and most favorite dishes among both foreigners and Thais. It always in the top ten list of not only most delicious but also most famous and most popular foods in the world as well. Tom Yum is one type of soup in Thailand. It consists of soup stock with herbs, lemongrass, galangal, kaffir lime leaf and a choice of meat and vegetables. In this case the choice of meat will be “goong”= shrimp. The soup is normally seasoned with fish sauce, lime juice and chilies. There are also optional add-ons, such as Nam Phrik Pao (chili jam), and sometimes milk or even coconut milk. Tom Yum is widely eaten all over the country. Some of you who know how to make Tom Kha Soup might ask how the two soups are different. The difference is Tom Kha is a thick soup with a coconut base and heavy on young galangal for the herb, but Tom Yum originally was a clear broth with lemongrass as the lead herb, followed with kaffir lime leaf, and the galangal would be less prominent in this soup. The biggest difference for me is Tom Yam is so hot and spicy and Tom Kha is milder. When I was a kid growing up in Bangkok, Tom Kha didn’t have Nam Phrik Pao (Thai Chili Jam) in it and also had no chilies floating on top to scare me away. Very different from Tom Yam, in which I can smell the chilies from far away. And once I got a closer look, the bowl of soup was just as intimidating with red color that I thought was chilies, but it was in fact oil from the Nam Phrik Pao (the versatile Thai chili jam), and the real “torpedo”, whole chili pods, crushed lightly to break the skin, floating all over the surface of the bowl. I started to develop a taste for Tom Yum when I requested the cook at my house make Tom Yum without chili for me. It was so refreshing; just a clear, herb-filled broth, seasoned with fish sauce and fresh-squeezed lime juice. Did you know that if you put shrimp in Tom Yum then squeeze fresh lime juice in the broth, the acid in the lime juice will make the soup foggy? Ha ha, it was child play at the dining table to stir the soup, making it all foggy and then waiting for the “fog” to settle down at the bottom of the bowl. It was the best way to relieve the boredom from the “adult” conversation! I think that also made me like Tom Yum Goong. Another time that made me LOVE Tom Yum was when I went camping with my dad on one of his so-called “hunting trips”, that was not really a “hunting” trip because he never shot a thing, but we were at least going in the jungle with a hunter as a guide. Before we left for the trip, the hunter would gather lemongrass, kaffir lime leaf and galangal, and put them in his backpack. He would turn to me and say, “We will be eating Tom Yum tonight and I will make sure you get one without chili.” That was good enough for me. We would walk walk walk until my legs were so tired, then we finally stopped. That’s when the fun began. They raised a campsite and then went “hunting” for something to eat. I would be playing around the campsite with my dad. The “hunting team” would come back with either fish, birds, or some other kind of small animals. Then the hunter and the sherpas would start cooking. Of course he would make Tom Yum. His Tom Yum was so simple. I was watching closely. He heated a pot of coconut water, from coconuts just cut down from a nearby tree, bring it to a boil, then throw the lemongrass, kaffir lime leaves and a few slices of galangal in, then wait until it boiled again and would then throw in the chopped-up birds that they caught, having already plucked and gutted them. Once it boiled again he would add salt and fresh young coconut and young tamarind tips fresh-picked from a tree, and chopped-up Ma Dan fruit (both add the sour taste to the soup in place of lime juice). When it reached another boil, then he would scoop some of the soup into one of the bowls, which were only coconut shells cut in half, and hand it to me right before the sherpa added a handful of chopped chilies into the pot. It was so delicious! Then DON’T make Tom Yum from scratch. You will have a better chance making Tom Yum from a pre-mix, either Knorr Tom Yum bouillons, or Tom Yum premixed in the jar. Extra small #61/70 would average 65 shrimp (with head and shell included) to make a whole pound. Small #51/60 average 55 shrimp/lb. Medium #41/50 average 45 shrimp/lb. Medium large #36/40 average 38 shrimp/lb. Large #31/35 average 33 shrimp/lb. Extra large #26/30 average 28 shrimp/lb. Jumbo #21/25 average 23 shrimp/lb. Extra jumbo #16/20 average 18 shrimp/lb. Colossal #U/15 average 14 shrimp/lb. Extra Colossal #U/12 average 10 shrimp/lb. Super Colossal #U/10 average 7 shrimp/lb. The next larger sizes are no longer called shrimp in the US; they call them “prawns”! So confusing to the Aussies, who call every size prawn, isn’t it? I don’t remember how the British describe shrimp or prawns, so share with me if you know. The prawn is the really large size, starting from #2-4, 4-6, and 6-8,using the same measurement concept. 1) If you are using the big size prawns like me, peel them but leave the heads intact. De-vein the prawns and keep all the shells. If you are using shrimp (smaller-sized prawns), pull the heads off along with the shells and save them, also then deveining them. Set them aside. 2) Boil the stock or water; we need about 6 cups here. 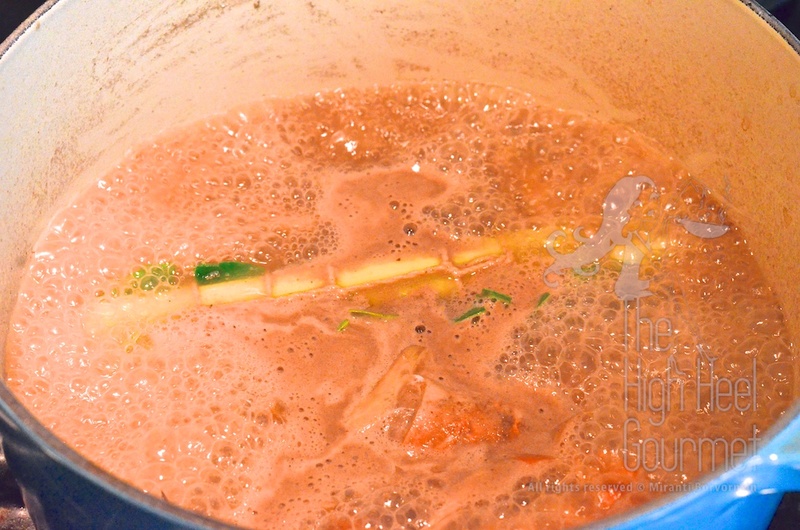 Once the water boils add the shrimp/prawn shells, and over the course of cooking, add water or stock as needed. 3) While you wait for the soup to re-boil, crush the lemongrass along the stalks and cut them down to fit the size of your pot. Peel the galangal and slice it thinly. 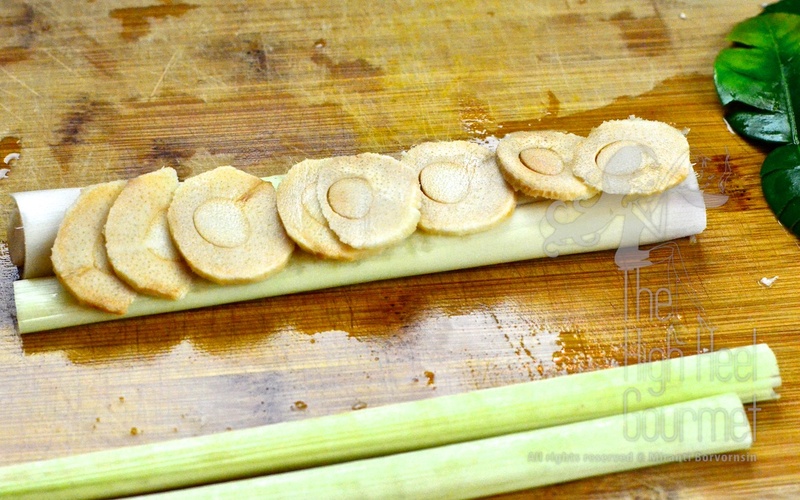 Stack all galangal chips on top of the smashed lemongrass stalks. Now tear the kaffir lime leaves but I keep the stem to keep them attached. Put torn kaffir lime leaves on top of the galangal chips. Tie all of them into a bouquet garni so you don’t have to chase after them later. The fifty shades of herbs moment…Tie them all up! I sliced half of the lemongrass diagonally too but continue reading to see when I put them in the soup. 4) The water should be back to boiling now, so drop the bouquet garni in the pot and let it come back to a boil again, then lower the heat and let it simmer for another 10 minutes. 5.1) Add the saltiness first. In this case we add fish sauce, then some salt if the fish sauce isn’t enough. You can use all fish sauce if you enjoy the fishy smell, but I usually use salt to add saltiness and fish sauce just for the flavor. 5.2) TASTE the soup! Yes, we have to test the waters 🙂 See if you need any more salt. No, we do not put the lime juice in just yet. Be patient! 7) Increase the heat to high again. Add the mushrooms, tomatoes, young coconut and the prawns or shrimp. If you want your Tom Yum to be quite hot and spicy, you can add chilies right now, but if you want it somewhat spicy but don’t want it to kill your guests or family members, WAIT! To make it even spicier, crush the chilies before you add them in. 8) Let it come back to a boil, then turn off the heat right away. Now add Nam Phrik Pao, crushed chilies, lime juice, and if you want to use milk or coconut milk to make it creamy, you add it right now. Before you serve, garnish with green onion and cilantro. 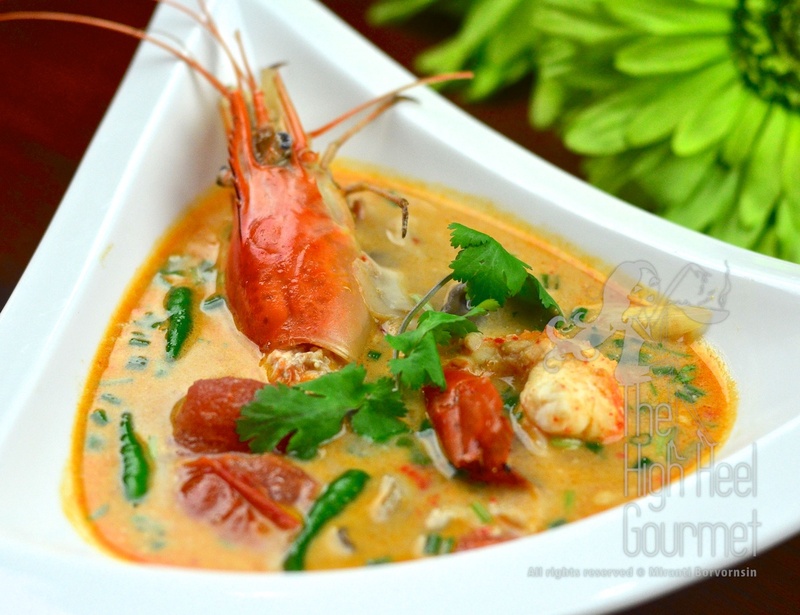 This entry was posted in Boil, Clicking in the Kitchen, Comfort Food, Dinner, Gluten Free, Seafood, Soup, Thai and tagged Asian, Cooking, Food, Galangal, Hot and Sour soup, kaffir lime, lemongrass, Nam Phrik Pao, prawn, Recipe, Seafood, shrimp, Soup, Spicy, Thai food, Tom Yum, Tom Yum Goong, Tom Yum Goong Nam Khon. Bookmark the permalink. if using dry Kaffir lime leaves, would you add more than if using fresh leaves? Do the fresh leaves freeze well? You probably need two-three times more of the dried leaves. Yes the leaves can be frozen really well. Where in the world are you? In the US Metropolitan area, if you can find an Asian store, they usually have the fresh locally grown. In the EU you will find the frozen import because they wont allow the fresh import. My question is that if you have 3 tops left from the curry paste, do you just add another full stalk lemongrass to make 4? Or you have to compensate with an extra full stalk ? If I answer this question my grandmother style, she would have said just put the full one in and smell it if it balance…haha. My instinct is to put 2 full whole one in. The end of the stalk would not give strong aroma. I normally count the 3 end portions equal to one full. The balance in the soup is difficult to achieve if you don’t really know what is the right balance at first. Before you add the shrimp and lime, it would be leading with the smell of lemongrass with a hint of galangal and a whiff of kaffir lime. All of these would be then lesser as soon as you add lime juice and shrimp. 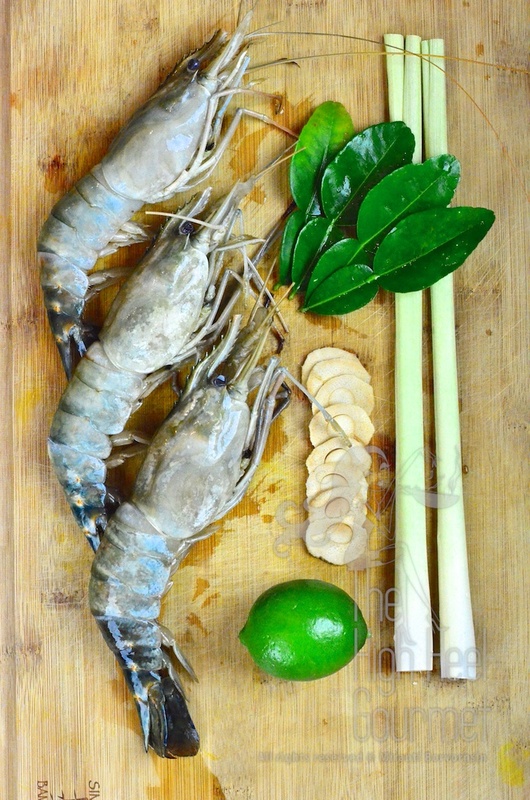 Then the finish would be lemongrass, lime and shrimp would be equally balance, if any single one of it stand out, next time reduce that ingredient. The rest are accessories. Would this is confusing or helpful? Ask away if you still have questions. If you are not sure about the right balance and have to do the taste test quite a bit, chili is the last thing to put in the Tom yum soup or your tongue would be numbed before you get the balance. I don’t know if this is possible, but having a similar multi-step process when you make the curry paste would be amazing. There are so many ingredients involved that it is not easy to understand how each individual one contributes to the final balance. But I guess it is easy to taste the ingredient contribution to taste in a liquid soup than in a more consistent paste. Anyway, just wanted to thank you for the previous advice. Curry paste balancing is different because they’re all jumble in the same paste and sit there together. The order is more for the convenience of the maker if mortar and pestle is used. If you use the blender, the order isnt that critical. The last balance is to sniff the paste (haha sorry i dont have any better way to do it) to make sure that there is no other prominent smell of any ingredients but become a unified curry paste smell. I know its hard for someone who doesn’t know the paste or never surrounded by those smell all the times. It’s difficult to explain in words but its the same as making the croissant, once you start making them, you get a hang of it in about fifth or six times. The perfect homemade tom yum has been eluding me for years. I cook a lot of Thai food, but I’ve never been able to replicate the tom yum found in Thailand. I always assumed it was simply because the key ingredients aren’t as flavourful here in North America. It seems that no matter what I do, there’s just never enough lemongrass or galangal flavour on the soup. The new benchmark is the one I had just last week in Bangkok, on a sidewalk outside a little restaurant in Sathorn. It was positively overflowing with huge pieces of galangal and lemongrass and lime leaves, and it occurred to me that maybe more is better when it comes to the aromatics. You had to root around to find the chicken! In the meantime, just for fun I tried a pack of dry tom yum ingredients that I bought in Bangkok and made it tonight, but was very disappointed. I simmered the dry stuff for an hour, and it smelled wonderful, but when I strained out the inedibles, all that was left was a boring soup base that was only hot. The reconstituted ingredients in the strainer still smelled incredible. So I started to wonder if maybe too much cooking of the herbs actually has a negative effect. It’s my Waterloo, and I’m stumped! Yes, you don’t cook the herbs too long and you have to put a whole lot of them in the soup the get the flavors. You know even in Thailand if you see them making a big pot of Tom Yum, when they are about to serve a bowl to you, they add more fresh herbs and boil them to the boiling point again. 1) Lime juice, NEVER add lime juice when the pot still bubbling on stove. Turn off the heat before you squeeze the fresh line juice in the soup. 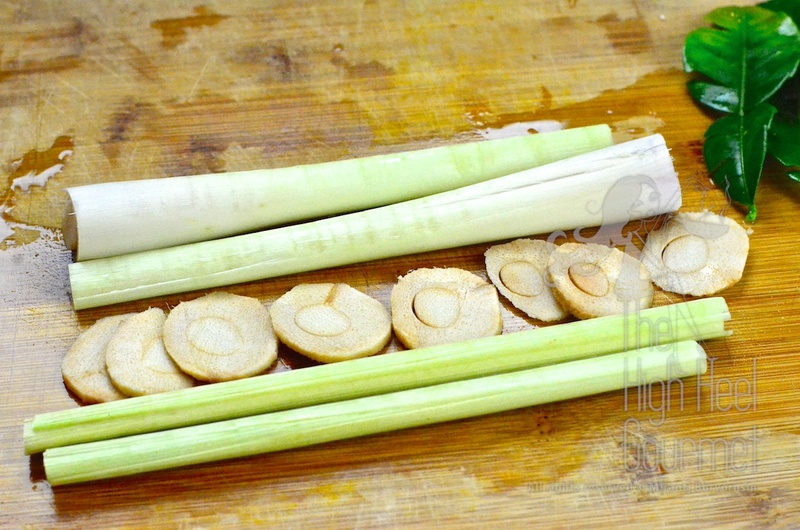 2) lemongrass and galangal need to be in boiling water but not for long. Once the whole pot bubbling thst’s enough. 3) kaffir lime leaves, save at least one leaf and bruised it, torn it add t the soup just right before you turn off the stove. 4) chilies smash the pod and drop it in at the same time as the kaffir lime leaf. I hope this can help improving the flavor for your Tom Yum. If you want the full street food vendor flavor, double the herbs in my ingredients and add chillies. Keep all the seasoning the same but reduce amount of water used. nice post.. i read it. Tom Yum Soup is one of my favorites! This is a great step-by-step recipe. Thanks! I really enjoy checking out your blog. You have incredible pictures and your recipes are laid out very well. I look forward to trying this dish out! Hi- I’m nominating you for a blog award. You can pick it up here: http://thecraftycultivator.wordpress.com/2013/05/06/first-ever-blog-award/ Just link back and pass it on to 10 of your friends! Tom Yum who could resist such a delicious dish like that? This looks beautiful 🙂 Thank you for stopping by and visiting my blog recently, I have just managed to squeeze in time to now come and say hi to you in yours.. wish I had done it earlier now. I love the care and thought you have put into this blog and the photography is great too. I look forward to reading more and trying some of your dishes very soon. My favourite dish of all time is Hainese Chicken Rice 😛 Best wishes from here in New Zealand! We made the soup tonight and I had to drop everything after slurping up the last bite to thank you! It was absolutely amazing. And so much fun to make! It is always good to add recipes to the ‘Favorites’ pile, and yours just shot to the absolute top. Thanks so much again! I’m glad you enjoy the process and the end result! Have you ever made it before this time? This looks amazing! My hubby and I just ate out last night at a local Thai restaurant. We’re not too familiar with Thai cuisine, but after that night, he asked me if I can learn how to cook those dishes. I hope to learn a lot from you! 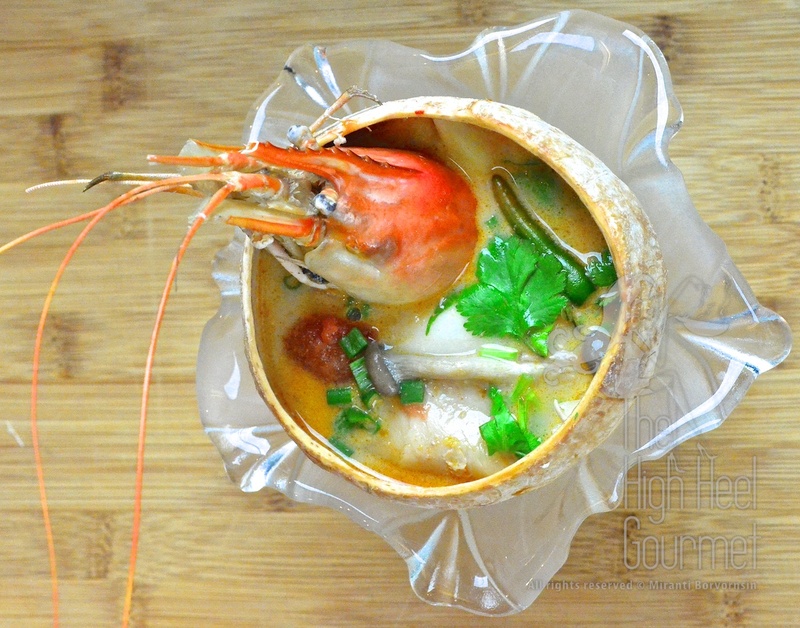 Tom Yum Goong is absolutely my most favorite soup in the world! I had a Thai roommate in college and she made the best Tom Yum, and Tom Kha, and Pad Thai, and … oh, she was just fabulous. Really miss her right about now while drooling over the picture here. I’m bookmarking this one. Hey, thank you very much for your visits and “Like”. It makes me very happy you take the time to do so despite you have plenty of other followers and many things to do I suppose. Thanks for visiting me back. Your blog is fun to visit. Can you tell that how much I love fashion? This is how much, I have to copy some of your post in France and translated them using google translator just to find out more about the pictures! Hello, thank you for your visit and have a nice day. My family loves Tom Yum! They love Tom Ka Gai too. I’ll have to try this recipe for my parents. I am definitely goint to check out your Kang Keiw Wan recipe too. One of my favorites! Makes me miss Bangkok. I know how you feel about missing Bangkok. Have you ever gone to Chiang Mai or other parts of Thailand? Yes! I also lived in Khon Kaen. I’ve been to Chiang Mai, Korat, Hua Hin, Phuket, Koh Samui, Pattaya to name a few. My brother lived in Chiang Mai this past year and is moving back to Bangkok in the fall. Do you go back often? Yes, at least once a year. ChiangMai is a nice place to live. There are a lot of great restaurants too. I made my own tom yum paste for the “Dried Tom Yum” but mine doesn’t contain any lime juice because it diminished all other herbs’ flavor. I agree with you the commercial Tom Yum paste aren’t that great. They put MSG in them too! This sounds so delicious. I’ve not been to our Thai market for AGES ’cause it’s awkward to get to but I’m looking forward to buying the Kaffir lime & galangal to create this. In the UK, we don’t use the number system (at least I’ve never seen it anyway) but would call the smallest ones shrimp and then it would probably be around number 31/35 we would start to call them prawns (smallest would be salad prawns, through to jumbo or king prawns), then the biggest (that you call prawns) we would call langoustine or Dublin Bay prawns. I remembered from the old time that the British called the tiny shrimp and the big one prawn but I have no idea at what’s size the shrimp got the upgraded name. Try it! This is actually is a very simple recipe. The trick is how to season it right. Most of my friend can’t get the right taste because they either afraid to put enough salt or fish sauce. Then they add the lime juice too soon after that, they get lost and can’t make it right. You can do it 🙂 and Thanks again…I really appreciate it. Yum! I wish I could have an asian cooking lesson from you! I couldn’t find the lime leafs when I was making tom khai gai soup. where do you get them? And the galangal? I’ve never heard of that? Where are you? I think Utah right. It might not be that easy to find but if you can find an Asian market then you are golden but it might be some in Salt Lake City but if you don’t want to drive. You can try all of these online company that will ship to your home. (I am not associate with any of them but I research for my readers) Some of them already arranged the set for you for Tom Kha, or Tom Yum and etc. Those lessons will be great! Wow, that looks so good, and so professional too! lol…right…in an honor of the prawns! This look amazing! I’ll have to make this with the Pad See Ew when I make it soon! 🙂 Could be a good combination! So um, I might have to eat every portion, I don’t think I am going to share….. This looks DELICIOUS! Time to go find fresh lemongrass and galangal. 🙂 And thanks for checking out my blog today. Looking forward to more of your recipes! 🙂 Thanks for coming back to visit. That must be the prettiest looking Tom Yum soup I have ever seen. Love the prawn head garnish. It still attached to the prawn too…not the bodiless head! Make the prawn looks real pretty enough to eat your brownies 😉 Love your recipes. This makes us VERY hungry in the office! We’re so glad that the Asian specialty produce we sent to you made it into your recipe! The Thai chills are they really from Thailand or grown somewhere near by? It’s soooo super hot and smell so good…thanks for sending them to me. Beautiful images. Great recipe. Thanks. How could you resist making this after looking at those photos??? Thank you! This is my favourite thing among all dishes during summer. Awesome post! Thank you so much, I can’t wait to try it! I like them both. I like coconut milk or milk with the shrimp but for non-seafoods I like clear broth. Once again your photos and instructions are superb. This is a fantastic dish and as you say known the world over, but nobody does it like the Thais of course. I know! It’s so difficult to get it close to the way they make in Thailand. That’s why I explain in detail about how to season it because that’s the most difficult one. Try this one and pay attention to Method #5 how to season it. Once you get the seasoning right, then the rest just adjust the amount of herbs to your liking. Tom Yam Goong is definitely one of my favorite spicy soups, cant really decide always between the clear and thicker version, either way I love it! I love the thick one for the shrimp only…the rest I like them clear. Fingers all crossed! Let me know if you can’t find the ingredients. I can point you to the online place. Thanks for the excellent recipe again! I’ll gonna make it today!!! I’ve never enjoyed reading a recipe more. The personal history, background information on the ingredients, bossy instructions, funny details and even the sneaky snippets of Thinglish that escaped your husband’s editing–it all had me entranced and laughing out loud. Who laughs when they read a cookbook? This is wonderful. Thank you for visiting my blog, and thank you for writing! You have a fun blog! Just the “about”, you already got me hooked! I haven’t gone through the whole blog yet but probably will be in a very near future. Keep writing, I’m following. OMG! I have to go raid the fridge now. WOW! That sure looks good.